The authors are with the Frontier Research Program, the Institute of Chemical and Physical Research, 2-1 Hirosawa, Wako-shi, Saitama 351-01, Japan. Several polymers often used as hosts in guest–host organic thin-film systems were investigated for their suitability as overlays for side-polished fiber (SPF) devices. Good optical quality, ∼10-μm-thick films were fabricated by spin coating and applied to SPF’s by use of a decal deposition technique to produce passive devices such as channel-dropping (CD) filters, bandpass filters, and polarizers with good throughput and high contrast ratios. The main CD features can be quantitatively explained by a weak coupled-mode model. SPF structures with doped overlays were also examined. 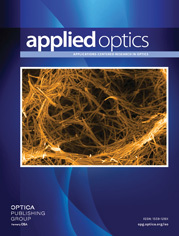 These measurements provided a means of determining several SPF device parameters and also allowed estimates of the nonlinearities required to make all-optical and electro-optic devices.